One of my biggest goals in life is to be retired (at least temporarily) by the time I decide to have children. As you are well aware, retirement costs money. And let me tell you, you can make a good chunk of money doing this blogging thing. It can pay way more than you need to suit your lifestyle, and the freedom it provides is incredible. But you see, if retirement is a goal of yours like it is for me, you’ve got to do more than just run a successful blog. Many people whole-heartedly believe that once their blog is making enough money to cover their expenses and their business’ expenses, they are ready to retire. Blogging is so far from passive that your income will drop the week you stop working on it. It doesn’t matter how big you are, or how much you make – if you stop updating your blog, your income is going to drop. This is inevitable, and for people who do not see it coming, it is incredibly sad. Because suddenly, you’re not making enough to live off of anymore. Think about what retirement means for a moment. It’s a pretty big deal. If you’re successful at it, you’ll only do it once (if that’s what you want, of course.) The problem is that many people do not plan accordingly and end up having to start over, often in a much harder position since they’ve been out of the game for so long. Therefore, it’s really important you think things through carefully and don’t take any big chances if you do not have to. The problem with blogging is that the income can be so volatile. It changes a lot, and there are a lot of factors that can determine your profitability. Markets change. Industries change. You change. Any of these changes has the power to not only lower your blogging income, but wipe it out completely. That means if you’re relying solely on your blogging income to pay your bills, you have a huge problem, and no time to deal with it. Uh oh. I don’t want to move too far away from blogging, but if you want to blog to retirement, there is no avoiding it. You need another income source. You couldn’t ‘use’ another income source. You don’t ‘want’ another income source. You NEED another income source. Failing to build up another source of income is what causes emergencies to ruin you, and force you back out of retirement and back into work. But not only do you need another income source, you need an income source that is reliable – an income source that you know will be there, regardless of what’s going on in your market, in your economy, and in the world. And I’ve got to be honest with you, there are really only a few of these – stocks, bonds, and real estate. If you want to guarantee a safe retirement that lasts until you’ve passed away, you need to secure your retirement through these income sources rather than through your website. There is a popular rule in the personal finance world called the 4% rule – this means that whatever your investment account is at the day you retire, you can withdrawal 4% of it per year, increasing each year with inflation. This is because the stock market rises on average 7% a year after accounting for inflation, so in theory your money should still actually grow during retirement. This means to retire off of stocks and bonds, you need 25x your annual living expenses. 30x is even safer, as the 4% rule has only been discovered to have a near 100% success rate for 30-year retirements. If you want to retire early like I do, you need to save even more. The other option is real estate, and honestly, it’s probably a good idea to do both when possible. Real estate benefits from the power of leverage – most of the money you can use to purchase your rental properties isn’t yours, which means you can acquire a lot more assets with a lot less money. Leverage makes real estate perhaps the quickest path to financial independence, but it’s also quite a bit more risky. Anyway, the ticket to retirement is simple. Instead of inflating your lifestyle to match up with your blogging income, spend as little as you possibly can, and invest whatever leftover profits from your blog that you can into alternative investments such as stocks, bonds, or real estate. THESE are channels you can retire comfortably off of. Investing your income is what’s going to bring you early retirement. Your blog may not always be here, but if you put your dollars to work for you, they will serve you well. And it’s incredibly powerful. Now you know what you have to do, but how do you go about doing it? The truth is, stepping on the path towards financial independence and early retirement is a lot easier than you probably think. It does not require a ton of money to start, it does not require a ton of economic knowledge, and it does not require a ton of upkeep either. I have developed a course that will take you by the hand and show you step-by-step not only how you can save as much money as possible (without noticing a difference in your quality of life) and then put that money to work for you in a safe, easy, and effective way. Using the concepts taught in this course, it is possible to retire in as little as 5 years – even if you don’t have a dime saved today! Click Here To Learn More About My Financial Independence / Early Retirement Course! I’m going to continue to blogging and building my portfolio until it comes time for me to ‘retire,’ although I highly doubt I’ll ever stop blogging completely. I just love what I’m doing too much to quit any time soon – but I will eventually have to tone it down a bit. I’d love to hear what your plans are for retirement, and how blogging will fit into it. And of course, I hope you join over 1000 other people who have already enrolled in my financial independence course. I’d love to have you as a student! 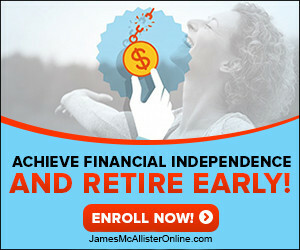 New Course: Achieve Financial Independence And Retire Early! HSMS 04: Can Blogging Bring Financial Freedom? Retirement to me is taking time off when I want. I don’t plan on spending time floundering in life playing shuffle board. I will be doing something until I drop dead or health issues will stop me. For that reason, I do not have my eggs in one basket. As I do enjoy blogging and marketing, I also have invested in various things. We all have to especially if we are entrepreneurs. A diversified investment plan is something needed if we decide that we do want to kick back. I doubt I ever will personally, because that’s the way I’m built…I have to keep up with things that interest me even though I am near that age of retirement lol. I do see some people that are the “retirement” age and ask them what are they going to do. Because they had the work mentality all their lives. Had jobs and the false sense of security, they don’t have a clue how they will compensate the measly pension they have to live on. They come up with the idea of working in Wallmart or something similar. What a disaster! This is why it is so important to invest no matter what stage of life one is at. I think you and me are both alike in that regard. I think it’s hard to really define retirement because it means so many different things for so many different people. In my financial independence course I stress that retirement isn’t about laying around watching TV all day, it is simply having the freedom of doing so if you wish. I do have a very strict goal of ‘retiring’ by the time I have children in 15-20 years. Very strict. I do not think I will ever give up blogging completely – I like it too much, but I need to be in a position where I can devote as much time to them as necessary. I am sure my bottom line will continue to increase until then, but I do not feel comfortable relying on that. Especially since after I go from business blogging to hobby blogging, that income is going to drop much quicker than I built it up. The thing is that there are so many uncertainties in life that we have to prepare for them the best we can, especially when we are talking about such a big topic. Most people do not prepare. Hearing you say that people think working at Walmart is a viable option saddens me. Financial independence isn’t hard, even for low-income people. It takes more time of course, but it is easily possible. I have talked a lot about the topic at various events and most people do not realize it is an actual possibility. I hope to get my course in front of as many people as possible so I can change that. Super sound advice man. I’ve retired to a life of island hopping through smart blogging but I have a pension from my pier guard days too. Me and my wife have other retirement accounts and hell, we blog for the joy of blogging, for the fun of it, so we’ll likely blog until we can blog no more…on this plane…wink wink 😉 Open those income streams, enjoy the journey and don’t rely on blogging alone to fund your lifestyle. I think maybe we see blogging a different way. Don’t get me wrong, I’d do it for free, but I see blogging as another job, so I can’t consider myself to be retired yet. I know that if I were relying solely on income from my websites / email lists, and I stepped away from the computer for 6 months, I’d be in huge, huge trouble. I know you have set up additional income streams that don’t seem to be under any threat now or in the near-future, so I know you’ll be OK. Some of the other people I’ve met though… not so much. Good to talk to you again Ryan! Hey James, this post really opened up my eyes. I’d like to think that I’ll still be blogging and earning a living online way past my retirement state, hopefully until I’m either dead or too old to even lift a finger to type a single word. I think having one income source as you say is a bad idea in any case as a blogger, I have several websites all with several income streams sounds, and for me personally thats a better strategy than investing in things I don’t really understand like bonds and stocks lol. One other thing I will most definitely agree with you here is that passive income is only passive if you continue to work at it. I know from stopping blogging and working on my business to take some time off some years back, that after a few weeks, the income becomes less and less. Have an awesome weekend mate – Fabrizio. Hi Fabrizio! It’s great to meet you. I suppose it is a lot safer if you are investing in different websites in different markets, but that’s the key, you really need to be reinvesting back into and growing those businesses. And still, it’s a strategy that’s far too risky for me to bet my retirement on, in the same way that picking only a few stocks for an investment portfolio would be incredibly dangerous. and for me personally thats a better strategy than investing in things I don’t really understand like bonds and stocks lol. That’s because you haven’t signed up for my financial independence course. 😉 It’s really a lot easier and safer than you probably think it is. You are right that the income dries up, and a lot of people don’t realize that until it’s too late. Even passive platforms like Kindle will eventually slow down as well – but blogging is about as far from passive as it gets. I have witnessed this firsthand when I have let old websites of mine die. Good to meet you Fabrizio and I hope to talk to you again soon! James McAllister recently posted…Taking A Break From Blogging? Don’t Feel Bad! I’ve tried retirement and it was boring. For some people sitting around a pool all day drinking pina colada’s is a blissful existence. But to others like me, we want more. Essentially the brain needs constant stimulation for it to work well. To avoid atrophy it also needs problems to solve, challenges to overcome. What I’ve noticed with the early retirement crowd is that they seem to deteriorate faster. Some of them even become substance abusers for no other reason than they’ve lost their purpose, their compass. Donna said it well with her comment that retirement is really about having the freedom to do what you want when you want. I am into that in a big way! Finally your point about achieving financial independence by investing what you make from blogging and internet marketing into solid assets is totally the right thing to say. Anyone who thinks they can live off the money they make from their business is delusional. The business is simply the cash cow, that’s all it is. The right way to do it is to save and invest, which is why they should grab your course!. I personally think retirement is all about freedom. I know I could never be content with lazing around all day, I am too driven for that. But having the freedom of doing so when I want to is also appealing. Really, my main goal is to be in a position where I can take as much time off as I need to spend with my children as they are growing. I know for certain I will have to scale back the work I’m doing now, so it’s imperative that I build up other income streams. You make a good point about stimulation and purpose. I have read a lot of people who retire early and then go back to work because they just can’t handle having that much free time. It’s a problem and a challenge, but a good one to have. For people in my course, I often recommend picking up hobbies or donating time to charities. In other cases, I recommend starting businesses that you believe in. With money no longer being an issue, you have a lot of freedom to pursue ideas, and I don’t know about you, but I feel my businesses give me a huge sense of purpose and meaning. Not to mention, something to do. I’m glad you agree on investing into other assets. This has been my strategy for a while now and will continue to be in the forseeable future. Other than my portfolio of stocks, bonds, and REITs, I have also partnered up with somebody, and we are about to begin buying apartments / multifamily houses. If I didn’t love this business so much and the sense of purpose it gives me, I’d jump into that full-time because that’s certainly going to be the bigger money maker over the years. Anyway Kim I’m glad we agree on so many points. Hearing from somebody who has already tried retirement and is back in the game is refreshing.